The snow appears to have vacated the yard. (At least for the time being!) 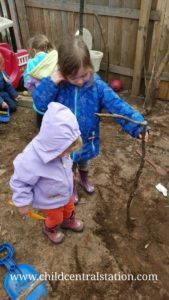 The children were quite excited to find the pile of Sticks that was covered by the snow and have been spending time making a house of sticks! 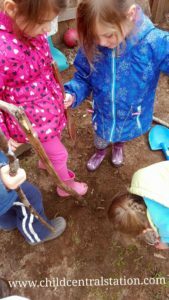 The story of the 3 little pigs has been popular for quite some time. 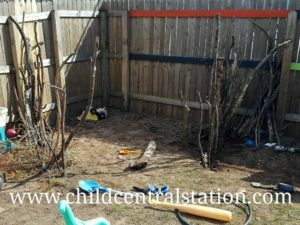 It has been a daily request, often multiple times a day, so upon discovering our giant pile of sticks it made perfect sense that the children "piggies" decided to build their house of sticks. 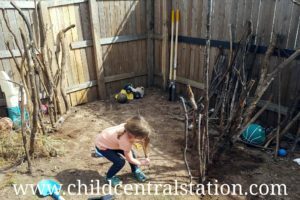 The children found it easy to push some of the sticks into the dirt. 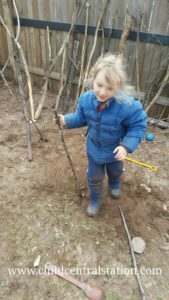 At other times they dug holes and then buried the bottom of the sticks. It has been an ongoing project for a couple of days. I am not sure what the next step will be, or if the house is now complete. We will have to wait and see! Oh, and I almost forgot!! 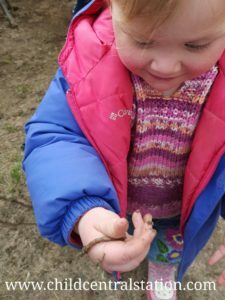 All of that digging in the dirt lead to some worm discoveries too!! !